"Great service as always "
Read our customers' honest and impartial Ford Ka car reviews and ratings to easily find your next car at Motorparks. Love my new KA it's very nippy ideal for the quick trips round town and cheap to run. Having only had the vehicle for two weeks it is difficult to give an accurate summary but I like ford products and am very pleased at present thank you. I am thrilled and delighted with my Ka, an absolute pleasure to drive. My first car was a Ford KA, that's why I went back to Ford. When I was looking for a car, friends were telling me to go for a Ford Focus or Fiesta. My car now is a Ford KA-Plus Zetec, two months old and I love it. Very reliable, easy to drive and I'm always finding something new. The sales rep, Alex at Dees Wimbledon was very nice and helpful. A brilliant average sized car, lovely to drive. The car is exactly what I was looking for and runs really well. Another great little KA! I had the older model for 12 years and now am much enjoying the new version. Do miss the little centre clock! I am delighted with my KA-Plus. It is light and easy to drive and is quite like a small Fiesta. It has all the extras of a bigger car and is completely upgraded from previous Ka models. I would highly recommend it. I love my KA-Plus! I first got to drive one last year as a replacement while my car was in for it's MOT, fell in love with the model right there and then. The car is smaller than my old Focus but feels just as roomy. I confess I haven't figured out how to use all the functionality on the console panel, but what I have used has been easy to understand. The engine is smaller than I'm used to but don't let that put you off if you are going to a smaller engine as it's a quick little car and the road handling is excellent. I can't fault this car at all, one of the best purchases I've ever made!! I bought a Ka Black Edition from Invicta Motors Thanet. I love its smart appearance, with complementary black and white interior. It's a smart car but very practical for me. I do a variety of driving, country roads, town and motorways. 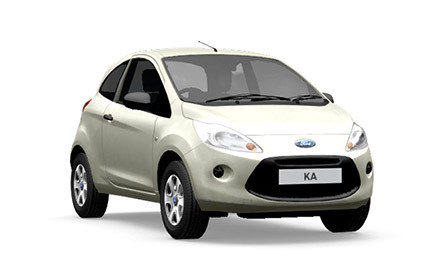 The Ka is economical, easy to park and fun to drive. It's a three door car, so not a family car, but big enough for passengers in the back to be comfortable. This is my fourth Ka so I am a fan. Having changed from Vauxhalls after many years to a Ford B Max I was looking for a smaller run about car and the Ford Ka seemed to fit the bill. Now having owned and driven one for a few weeks its the right choice. Small compact ideal for about town and yet has enough room to fit in what I want and only 30 pounds a year road tax!!! The parcel shelf is a bit annoying, as keeps coming out of it's slots, especially when getting bags out of the boot. Would be better if it had a bit of a rubber edging so it had something to grip onto like the Fiesta. Otherwise, the Ka-Plus city pack has some good extras such as the heated seats, which have been useful in the recent cold weather. It is nippy around town, good handling on the motorway at 70mph and enough leg room for rear seat passengers. Have yet to try out the cruise control. I love this car. It is so spacious inside with very comfortable seats. The price of the car new is very reasonable. It runs very well. I bought my KA Edge very recently and I have been very pleased. It's a very comfortable car to drive. Comfortable and smooth drive. Easy to park in small spaces. Plenty of space in boot. Love being able to put your own music in the car and radio is so clear. Happy with my KA Zetec although it does have a strange smell inside I can't get rid of! Drives well and very comfortable. View out of rear passenger windows a bit restricted. I do find the drivers seat belt fixing a little too high and cuts into my neck a bit. My new car is amazing. Perfect size for the grandkids buggy and the usual trip to the supermarket. Very easy to manoeuvre and compact but spacious. Highly recommended. I found my new KA&plus; very comfortable and I feel very secure in it. The instruments are easy to use. Gears work smoothly and you don't have to struggle to put the handbrake on and off. A very stable car and looks good. I'm very happy with my new car - Ford KA Zetec. I would like to particularly mention the great service that I got from Neil Coker at Invicta Thanet. An absolute professional, and really goes out of his way to be helpful. I will definitely recommend Invicta Thanet to my friends. Lovely car drives lovely does not take much petrol very pleased and the service I got was great. Thankyou ford. The KA-Plus we bought is a very nice car for people wanting a small car. Compact, nicely finished interior with all the options we required. Very satisfied with our purchase. Drives fab! so quiet you almost think its not running. Although may be a design fault the rear bumper allows rain/dirt to settle on it I think maybe it should be a bit more sloped like some of the other newer cars in the Ford range, but otherwise well worth purchasing the Zetec model for all its extras and the roadside appeal and drive. Car lovely and comfortable to drive. Slightly slow up hills.